Above: Good food and a good cause. Order up! Photograph by John McCauley. Carmen Rodriguez started out as a migrant farm laborer, cooking meals on the radiator of the family car. He got mixed up in gang life in Chicago and was shot at while washing dishes in a restaurant kitchen. Eventually, though, he rose to executive chef at top restaurants in Santa Fe, California, and Florida, and in 2012 he was voted New Mexico Chef of the Year. 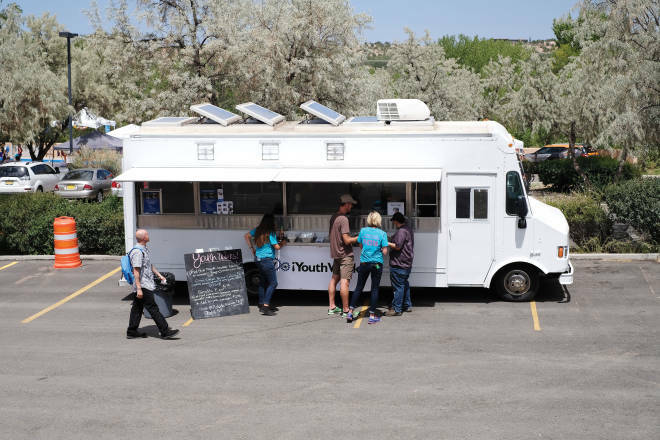 He’s paying it back by helming the culinary arts program for disconnected kids at the nonprofit YouthWorks, in Santa Fe. He runs a tight kitchen, and the hardworking young cooks he trains are producing eye-popping gourmet meals and catering events for clients like the Spanish Colonial Arts Society, the New Mexico History Museum and Palace of the Governors, and Santa Fe Mayor Alan Webber. Now he’s rolling with his culinary team in a food truck, from which you can savor stellar street eats like Mi Cuba Linda (carnitas, ham, mustard, Swiss cheese, pickles) and Arroz Chinoteños (choice of green chile, red chile, or plain teriyaki with stir-fried vegetables and choice of meat or tofu served in a Chinese food takeout carton). All for reasonable prices. Add a liquid delight with a custom Italian soda. Check the website to find out where the truck will be parked next.